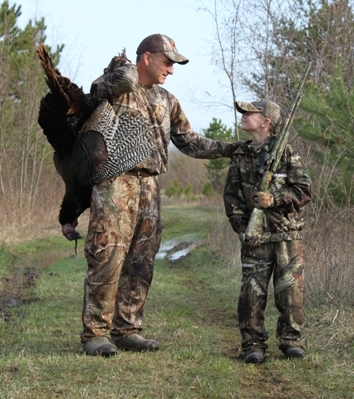 Spring is just around the corner, and folks are thinking about the coming turkey season, but did you know how far Michigan has really come in the turkey world? For the first time in history, wild turkeys can be found in every county of the Lower Peninsula, plus several areas of the Upper Peninsula. In 1977, only 400 birds were harvested during the season, and today harvest numbers are over 30,000 birds! This success didn’t just happen overnight, but over the last half-century. At one time in Michigan’s history, turkeys were very plentiful, although over time they vanished from every county in Michigan because of unregulated take and loss of habitat. Many efforts to re-establish the population were made from 1919 through late 1983. Michigan biologists took notice of Pennsylvania’s success and received birds from that state in 1954, matching the Pennsylvania habitat with an area of southern Michigan. The area chosen was the Allegan State Game Area. Through the 1980s, wild turkeys were relocated from Iowa and Missouri to establish the southern Michigan wild turkey populations. Turkeys also were taken from southern Michigan to northern Michigan in order to help achieve the statewide success we experience today. Just getting the birds there wasn’t the only concern – year-round food and cover for turkeys also needed to be provided. In 2013 alone, over 70 landowners – with the help of the National Wild Turkey Federation (NWTF) and the DNR – have put in over 450 acres for an annual winter food source, such as corn or other grains and crop mixes that withstand winter conditions. Crops are not harvested and are left standing through the winter to provide a food source that turkeys can reach. Although a turkey can go up to 14 days without food, trees that hold their fruit through the winter and permanent unharvested crops provide a food source that is readily available above the snow. DNR wildlife biologists from across the northern Lower Peninsula have been working with turkey enthusiasts such as the NWTF, Michigan Wild Turkey Hunters Association (MWTHA), private landowners and the U.S. Forest Service for over a decade. These partners have been able to adapt new techniques and maintain a high level of performance for the program. “I would recommend this great opportunity to someone who wants to make a difference during the winter for turkeys,” said Garner. NWTF members can get grain seed for winter plots from the NWTF Conservation Seed Program, where outdated corn from large seed companies is distributed to NWTF members for only the shipping and handling fee, approximately 10 percent of the retail cost. How can you get involved? Work with your local turkey hunting group, such as your local NWTF chapter. As part of the new license structure, funding will be dedicated for public and private landowner turkey enthusiasts to create outstanding turkey habitat and hunting opportunities. So this year, when you are out listening for gobbles, you’ll know you’re experiencing, first-hand, one of the best conservation success stories in Michigan history! To learn more about wild turkeys, visit www.michigan.gov/turkey. Click here for a turkey target to pattern your shotgun for turkey season. Photo 1: Michigan Wild Turkey Hunter Association members release turkeys in Lake County. Photo 2: Pat and Josh McKenna harvest a spring gobbler in Gladwin County.